The book is a collection of essays spawned by the intense controversy of the National Air and Space Museum (NASM) proposed exhibit displaying the Enola Gay. The Enola Gay exhibit was meant as part of a conscious move on the part of the Smithsonian to move the NASM from a “temple” to aviation and industry to a “forum” where contemporary issues relating to airpower and aviation are presented before the public. In the planning stages controversy and criticism came from many directions – neither entirely from the left, the right, or the military. There was no coherent “veteran” position – some opposed displaying the Gay at all – unlike what would emerge once the controversy broke open. The proposed exhibit was broken into five parts: “Fighting to the Finish” (context of WW2), “Decision to Drop the Bomb” (where the cases for and against are presented but no firm moral conclusion is reached), “Delivering the Bomb” (how the bomb & bomber were built, the actual Enola Gay is displayed), “Ground Zero” (results of the bombing), and “The Legacy of Hiroshima and Nagasaki” (impact of bomb on surrender of Japan). Once the controversy breaks open, criticism with be organized by the Air Force Association (AFA) – a private lobbying group of (mostly) Air Force veterans. The line devised by the AFA was that the exhibit was pro-Japanese, used extreme imagery, and downplayed or ignored the suffering of American troops. NASM officials viewed this criticism as extreme & unfair. Academic advisors (of which one the authors of this volume, Edward Linenthal) were supportive. The only academic criticism was the opposite of the AFA – that the exhibit may be too celebratory. Internal Smithsonian criticism was muted – exhibit was good, could use some “balancing” and stressing of Japanese brutality and aggression. The public debate over the Enola Gay exhibit was dominated by the AFA. The AFA decided to go public in 1994 after being “frustrated” by what they saw as stonewalling. Criticism caused NASM to form the “Tiger Committee” of veterans and military historians to suggest revisions. A new script was written per these recommendations which stressed even more context, American causalities and war-weariness, along with Japanese atrocities. However, such revisions were ignored in the press and a narrative of a stubborn and condescending NASM and Smithsonian leadership developed. The exhibit became entirely politicized by the time of the revised exhibition and part of the larger culture wars of the 1990s. Scholars were late to the political game, marshaling a limited public relations campaign at the end of 1994 – after the debate had been dominated by veteran & anti-exhibition groups. In the end the debate over the Enola Gay became a controversy over not just the exhibit but an attack on the historian profession as politically correct and anti-American. The final outcome was that the Enola Gay was displayed with no accompanying exhibit. Simply the plane itself was displayed. Michael Sherry argues that by the 1990s there was a “narrowing” of national historical memory and its appropriation by the populous. 1930s and 1940s – national historical memory was “open” and dominated by liberals. Created space for African-American and non-Anglo-American ethnics to appropriate historical memory to challenge the status quo and call for their incorporation within the national community. Paul Boyer stresses how the general public views historians as “distorters” who violate true historical memory and reality with political correctness. Popular image of the “good war” leads to backlash against narratives that challenge American actions during the war – i.e. dropping the atomic bomb. The term “revisionist” becomes tied to anyone who critical of standing memories of historical narrative. This discourse places historians out of the “true” narrative of events. Within this discourse, status as veteran is believe to allow one to have the “appropriate” perspective on the bomb. 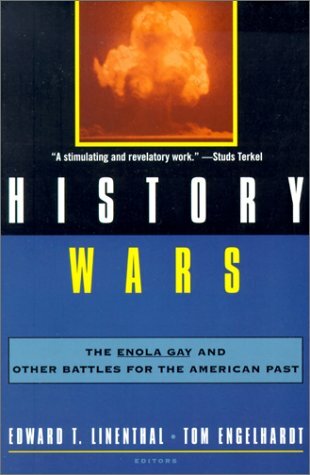 Mike Wallace and Richard Kohn both argue that the Enola Gay controversy slows that history under strong attack as part of the broader culture war. Historians need to understand that this is part of a broader attack on academy and actions are needed to organize against unwarranted attacks on the historical profession and historical thinking. Building on that, Marilyn Young argues that the true sin was not a lack of balance but its attempt at historicalization of the atomic bomb. What the final exhibit presented was un-history.